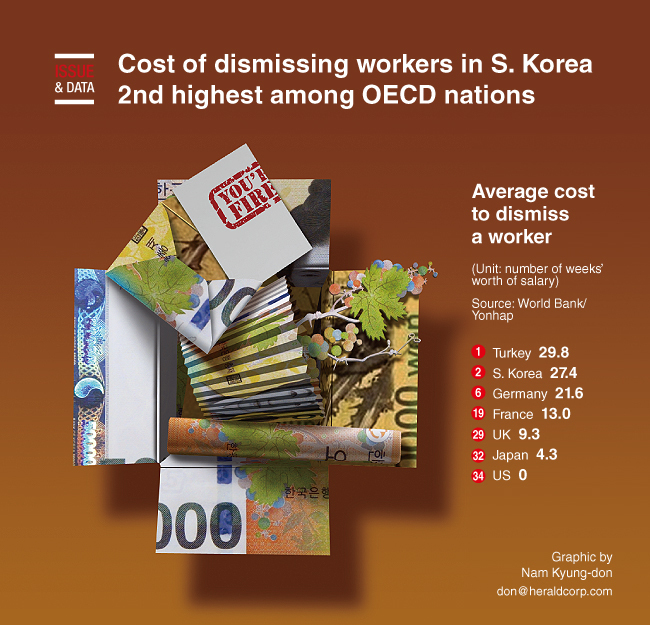 South Korea ranked second among the 36 members of the Organization for Economic Cooperation last year in terms of the cost of dismissing workers, a local think tank said. In 2018, Korean companies shouldered the second-highest burden when dismissing employees, the equivalent of 27.4 weeks’ salary on average, the Korea Economic Research Institute said in a statement. Only companies in Turkey paid more, with its workers entitled to 29.8 weeks’ wages upon dismissal. The OECD average, in contrast, was 14.2 weeks’ salary, KERI said, citing data from the World Bank’s “Doing Business 2019” report.